Labidocera aestiva, potentially the smallest critter in the world able to jump out of water into air, strikes the unique balance between size and velocity. Small creatures have stunning skills in the realm of physics: The hummingbird hovers. The swallow or bat snares mosquitoes on the wing. The gecko climbs the wall. The spider spins silk with the tensile strength of steel. The water strider walks on water. Now add to that list Labidocera aestiva, a three-millimeter copepod that swims speedily enough to break through the water surface and tumble through the air, presumably to escape predators. 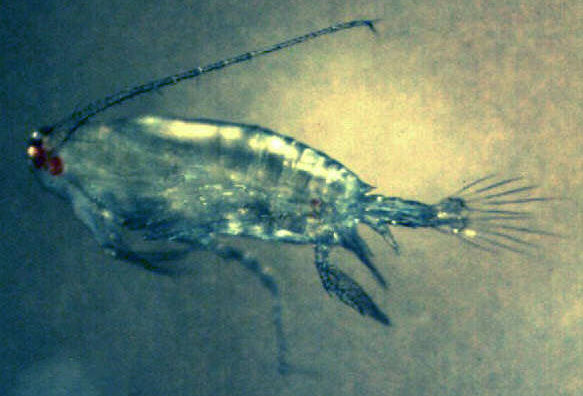 Copepods have external shells and are ultra-common in fresh- and salt-water. Although they are small (can we say "shrimpy"?) 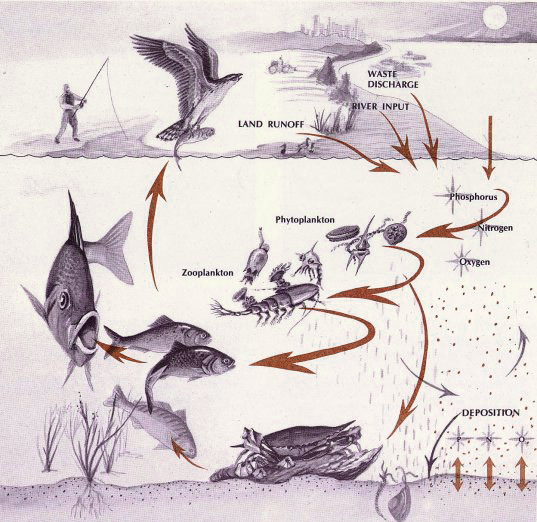 and occupy the base of the food chain, they may account for the majority of ocean biomass. In a report in the October edition of the journal Interface, Sunghwan Jung, an associate professor of biomedical engineering and mechanics in Virginia Tech’s College of Engineering, reported on a simulation -- powered by a retractable-pen spring -- that looked into the physics of four species of copepods. "Biologists had found this species that jumps out of the water, and they were just two or three millimeters in diameter," says Jung. "We wondered, how did such a small plankton jump out? Breaking the water surface is not easy for such a small object." Jung and colleagues used pellets to simulate four species of plankton, including one that could breach from the water into the air and three that could not. Using a high-speed video camera, the researchers explored the relationship between size, velocity and ability to penetrate the water surface. Plankton is a general term for small plants and animals that float and drift through the water. Copepods (zooplankton), likely the most abundant ocean animals, filter phytoplankton and feed the ocean’s diversity of finned creatures, from fish to whales. Surface tension -- a force caused by the attraction of water molecules that affects the movement of liquids -- is greatest at smaller diameters, Jung says, explaining that a shower head needs more pressure -- more energy -- to create tiny droplets than larger ones. Raindrops break up if their diameter exceeds two or three millimeters. "If a jumper is in that size range, that's the minimum length scale that can break the surface," Jung says. "If it's much smaller, it won't have enough kinetic energy to break the water surface." Previous comparisons of various copepods had found that only the largest species -- like L aestiva -- could penetrate the water surface and briefly become airborne. Rather than drafting an army of copepods for the experiment, Jung's group worked with non-living replacements. "When you do the biology, it's hard to change any parameter -- the speed, the size. They are born that way. With a physical experiment, using a spherical particle, you can shoot it at different speeds and angles, and then try to figure out what conditions are necessary to break the air-water interface." Jung’s research often uses biological systems, like drinking cats and dogs, and swimming worms, as inspiration for problems in fluid dynamics. He and his students routinely design model systems, using springs, weights, and 3D-printed components, to mimic the way animals interact with fluids. 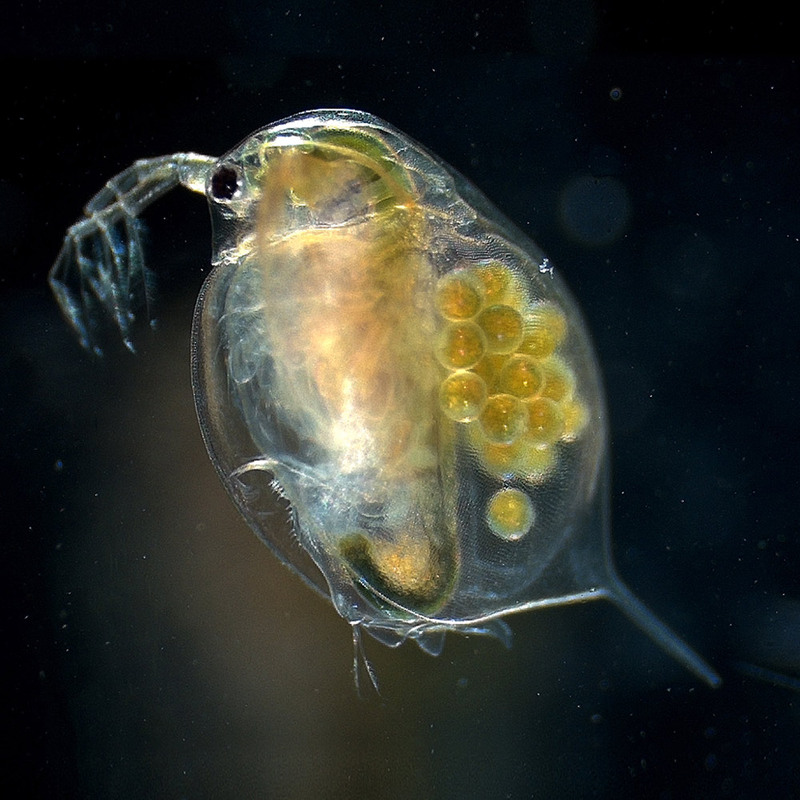 One of the three non-jumping species used in this study, Daphnia magna, is big enough to break through the surface tension, but swims too slowly to enter the air. For the copepods, the researchers found that velocity and size were the major influences on swimming into the air. "Other factors were not very important," Jung says. "We investigated the angles we found in biology, from vertical to 30 degrees off vertical, and did not see any effect." Even though a large body would make a copepod more visible to predators, evolution may have favored it since jumping protects the animals from hungry fish, he adds. The most surprising result was how well the experiment matched the animal data, Jung says. "We did not have the antenna, or body shape, but found a simple ball can represent what is going on when a plankton jumps; it means we captured the physics." The study seems to place a lower limit on the size of animal that can swim from water to air, he adds. For tiny plankton, “There’s a huge energy cost to deform the surface. Animals below a certain size will simply stretch the surface and bounce back instead of breaking through." Beyond the curiosity factor, the study could aid the "flotation systems" that mines and wastewater treatment plants use to clarify water, Jung says. As these systems bubble air through polluted water, the rising bubbles pick up contaminants. Once they emerge through the water surface, they can be skimmed off. Size, mass and velocity all matter in designing the most efficient flotation system, Jung points out.